FLABoats™ Florida used boats for sale since 1983. Please call owner Jerry at 912-506-3190. PLEASE, NO SOLICITATIONS OFFERING TO LIST OR SELL THIS ITEM FOR ME. An exceptionally roomy double cabin motor yacht, this 37' has the room of a 40'. There are two staterooms with queen berths in each and two heads, one with a tub. Equipped with a pair of 350 hp Yanmar diesel engines, she cruises easily at 21 knots, with a max speed of 31 knots WOT. 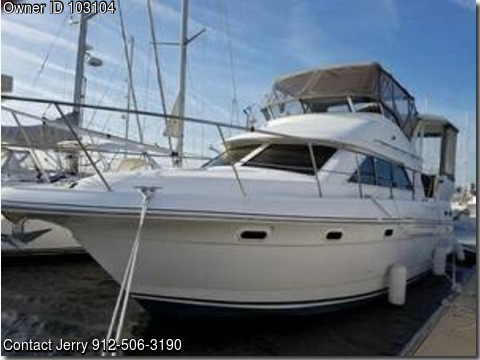 This 3750 has been lightly cruised and has only 405 hours on her engines. Loaded with all the comfort, safety and navigational options you would expect from a coastal cruiser. She was hauled out February 2015 and received the following services; Oil changed in all mechanical systems, replaced, and re-bedded all thru-hulls (intakes and discharges) below the water line, refreshed the isinglass, serviced reverse air systems, repainted hard top supports, repainted hull bottom and running gear, replaced headliner and side wall coverings in forward guest stateroom. In exceptional condition and easily seen in the water in Brunswick, GA.
Additional Specs, Equipment and Information: Boat Name; MYSTIC PEARL. LOA: 40 ft 0 in. Beam: 13 ft 8 in. Maximum Draft: 3 ft 2 in. Engine Brand: 350 HP Yanmar. Engine Model: 6LYA-STE Engine/Fuel Type: Diesel Engine Hours: 405 on one engine 381 on the other Tanks- Fresh Water Tanks: (68 Gallons),Fuel Tanks: (300 Gallons Diesel),Holding Tanks: (55 Gallons). Interior Accommodations- Sleeps 4 in 2 staterooms. The master is aft with queen size berth and in-suite head and tub. Forward is the guest stateroom with queen berth and day head with shower. Main cabin has a convertible dinette with down galley, dual reclining couch with TV across salon. All wood interior constructed with cherry wood. Recent haul out in 2015; replaced and re-bedded all through hulls to include seacocks; painted radar mount and hard top supports; new medium ablative bottom paint and barnacle barrier paint on running gear; installed ultra-sonic barnacle prevention system; tuned propellers; checked laser alignment of shafts and engines; installed swim platform access portals; Serviced main engines, generator, and drives. Galley --- • Dual Bench • Princess 2-burner stove • Microwave/convection oven with broiler • Refrigerator/freezer • Sink with pressure hot/cold water. Electronics ----- • Stereo W/CD player/top-side controls • VHF Radio • Hailer W/listen capability • Remote helm stereo • 29" smart TV W/sound bar in salon • Raymarine 90W radar/chart plotter • 15" Sitex Chart plotter • Sound system throughout vessel • 25" TV w/built in DVD in master stateroom • 19" TV in guest stateroom. Mechanical and Electrical Equipment ----- • Onan 9kw genset-420 hours • 110V/12V systems • Dual 30amp shore power • 12V lighting • 110V plugs • (2) Zone reverse cycle AC/HT/Dehumidifier • SMX II controls for AC/HT/Dehumidifier • Vacu-flush heads • Spotlight • U-line icemaker • LED bulbs throughout • 3000 battery charger • Ultra Sonic barnacle control system • Reverso Oil change System. Hull and Deck Equipment---- • Full fly bridge and aft deck enclosure • U-shaped lounge on bridge (sits 6) • Bench seating W/storage in cockpit area • Wing doors • Radar arch • Windlass w/deck foot switches • Mercury 330 Ocean Runner w/helm and 15hp EFI Suzuki • Integral bow pulpit with stainless rails • Integral swim platform with swim ladder • Molded in steps from swim platform • Dinghy cradle with removable 12V power winch. Closing Remarks- MYSTIC PEARL has been primarily used as a weekend cruiser. She has seen very light use and it shows. A very roomy double cabin with lots of headroom and living space for her length. Leave your broker at home and save on this well maintained cruiser. Disclaimer: I DO NOT NEED ASSISTANCE SELLING THIS ITEM, PLEASE, NO SOLICITATIONS OFFERING TO SELL IT FOR ME. The seller offers the details of this vessel in good faith but cannot guarantee or warrant the accuracy of this information nor warrant the condition of the vessel. A buyer should instruct his agents, or his surveyors to investigate such details as the buyer desires validated.